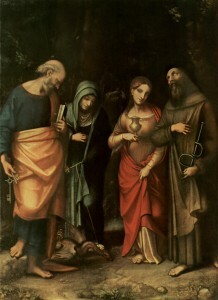 St Peter, St Martha, St Mary Magdalene, St Leonard (L–R), painting by Antonio Allegri da Correggio (1489–1534). O Lord, the source of all our good, who didst endue Saint Leonard with the grace of holiness: Make us so to abound in every good work that we may be counted worthy to obtain of thee all such excellent things as are needed for us; through Jesus Christ our Lord. Amen. O God, by whose grace thy blessed Abbot Leonard became a burning and a shining light in the Church: Grant that we may be inflamed with the same spirit of discipline and love, and ever walk before thee in the way of perfection as children of light; through Jesus Christ our Lord, who liveth and reigneth with thee and the Holy Ghost, ever one God, world without end. Amen.